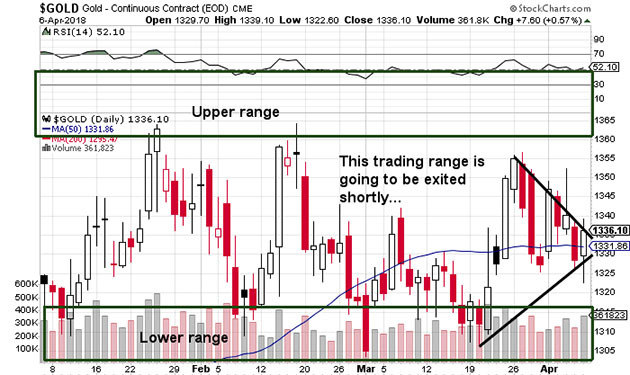 Technical expert Michael Ballanger discusses current market fluctuations and the gold and silver markets. As I watched Wednesday's CPI (inflation) number reported by the Commerce Department, I was immediately reminded of that classic scene from legendary WWII flick "Casablanca," where Claude Rains, playing police Captain Renault, shuts down Humphrey Bogart's casino/nightclub with the immortal words, "I shocked�SHOCKED�to find out that gambling is going on in here!" The croupier hands him a wad of bills�"Your winnings, sir"�to which he says, "Oh thank you very much. Now everyone out of here!" Well, I was shocked�SHOCKED, I tell you�to see that the U.S. inflation numbers came in a tad "hot." After all, the Fed has added some $5 trillion in additional "assets" to its balance sheet since 2008 and encouraged its foreign central bank cousins to do the same, which they have done with even greater enthusiasm. The movement toward serial currency-trashing has had us all awaiting the inevitable return of 1970s-style inflation, but thanks to the creative accounting and fictitious reporting, inflation is seen as "tame" by mostly everyone�but especially the financial media and "bond-badeers." The U.S. debt-to-GDP ratio has been increasing every year since 1980 with only a brief respite during the tech boom of the late '90s, and that has been a global theme of commonality as fiscal recklessness became the clarion call for Baby Boomers the world over. Nearly 10 years of financial repression has finally lifted as bond yields are rising to levels never quite seen by the legions of Millennials now trading for their livelihoods. The expansion of the Fed balance sheet has long been a source of fascination for me as I could never understand how any entity owned by its members (which are banks that are required to keep a minimum of reserves on hand and must report financial positions) could be allowed to buy trillions of dollars of toxic paper from its members in order for those members to avoid bankruptcy�and then report those noxious purchases as "assets" that remain on the books at book value. If they were threatening to sink the member banks, how can they be booked at face value or par? Should the Fed not report them as "non-performing loans," leaving a large hole in that balance sheet? Should the Fed, which is not a part of the U.S. government, not be audited, as are its members ("owners")? Why can the Fed buy, sell, and short (think volatility and gold) infinite amounts of anything and everything without ever getting a margin call? Are you not shocked�SHOCKED�that the Captain Renault of bond vigilante-ism isn't closing down that casino? Stocks caught an enormous bid this past week after the ice-water wake-up call of the previous week, but as I wrote about in last week's missive, you would have to be a complete fool to think that there would not be a "response" from 33 Liberty (NY Fed) and from the various serial interveners around the world. The volatility we saw last week spooked the politico-banker elite to the extent that we immediately witnessed dramatic moves to suppress the sudden and violent short covering in the VIX derivatives attached to equity market volatility. The 1,500-point swings in the Dow Jones were moved upon quickly, and by Monday afternoon, the "Buy-the-Dippers" had absorbed literally all of the panicky supply and voila! The Dow Jones now resides some 1,500 points off the lows and about 1,500 points from the all-time high. You see, everyone now agrees that one must never, ever underestimate the replacement power of stocks in a (hyper) inflationary spiral. So a "hot CPI" is bullish as hell, right? One week ago, I was a buyer of the leveraged Junior Miner ETF (JNUG) at $13.35 (20%) and watched it crater to $11.34, creating all sorts of problems for canine pets, adoring spouses, FedEx delivery personnel, and call-center employees. In dealing with issues related to "poor trading," I often times get caught up in semi-violent mood swings resulting in harsh responses to challenges such as overly-bound, impossible-to-open FedEx packages and overly-polite, impossible-to-understand bank support staff. I eagerly anticipate results from Stakeholder Gold Corp.'s (SRC:TSX.V) Goldstorm project, where the first hole in a 10-hole project has been drilled to an elevation of just above the water table at 6,000 feet (above sea level). Fingers and toes are crossed but since the shares have now pulled back from the $13M to $8M of market cap last week during the meltdown, there is no longer any speculative anticipation built into the share price. The company is spending $$2.5M over the next three years to earn 100%, so there is a lot of drilling ahead. And with such a big land position tied on Seabridge Gold Inc.'s (SEA:TSX; SA:NYSE.MKT) Snowstorm Project, 2018 will be an active exploration year for the area. As this is being finished, gold is trading up through $1,360 again, but once again silver is lagging, taking the silver:gold ratio to 80.71. 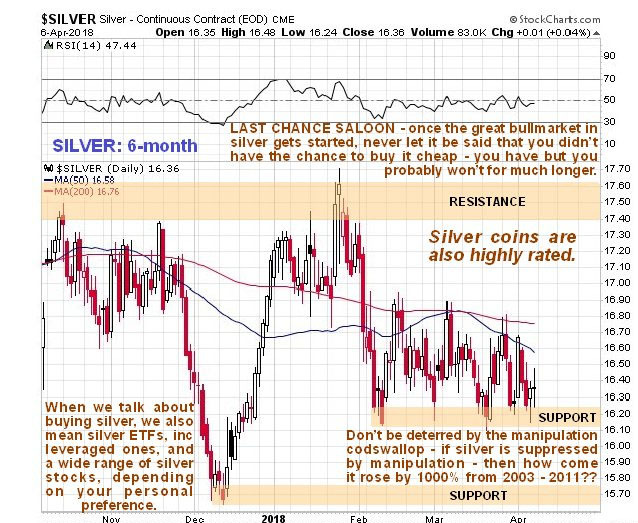 Hard to believe that in 2001, I was buying silver in the $4.00 range at the same ratio to gold�10 years later, it was at $50. 1) Michael J. Ballanger: I, or members of my immediate household or family, own shares of the following companies mentioned in this article: Stakeholder Gold Corp. I personally am, or members of my immediate household or family are, paid by the following companies mentioned in this article: None. My company has a financial relationship with the following companies referred to in this article: Stakeholder Gold Corporation. I determined which companies would be included in this article based on my research and understanding of the sector. Additional disclosures are below. 2) The following companies mentioned in this article are billboard sponsors of Streetwise Reports: Seabridge Gold. Click here for important disclosures about sponsor fees. The information provided above is for informational purposes only and is not a recommendation to buy or sell any security. 5) From time to time, Streetwise Reports LLC and its directors, officers, employees or members of their families, as well as persons interviewed for articles and interviews on the site, may have a long or short position in securities mentioned. Directors, officers, employees or members of their immediate families are prohibited from making purchases and/or sales of those securities in the open market or otherwise from the time of the interview or the decision to write an article, until one week after the publication of the interview or article. As of the date of this article, officers and/or employees of Streetwise Reports LLC (including members of their household) own securities of Stakeholder Gold, a company mentioned in this article. The company Gold Newsletter editor Brien Lundin named as a top pick in a Streetwise Report interview just released high-grade drill results. 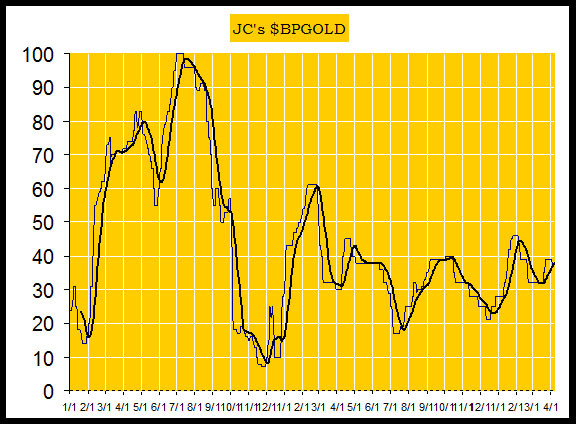 Technical analyst Jack Chan updates the gold and silver charts and finds buy signals for both gold and silver. Eric Zaunscherb, an analyst with Canaccord Genuity, reviewed and interpreted this company's recent drill results. Precious metals expert Michael Ballanger discusses Donald Trump's trade war with China and the implications for the gold market. 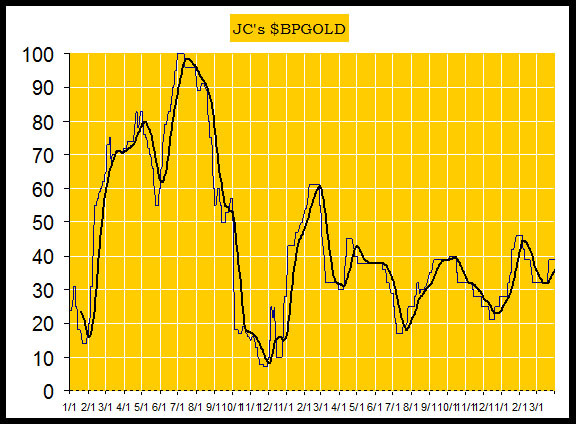 Technical analyst Clive Maund states that both COTs and the silver-to-gold ratio are at record extremes. 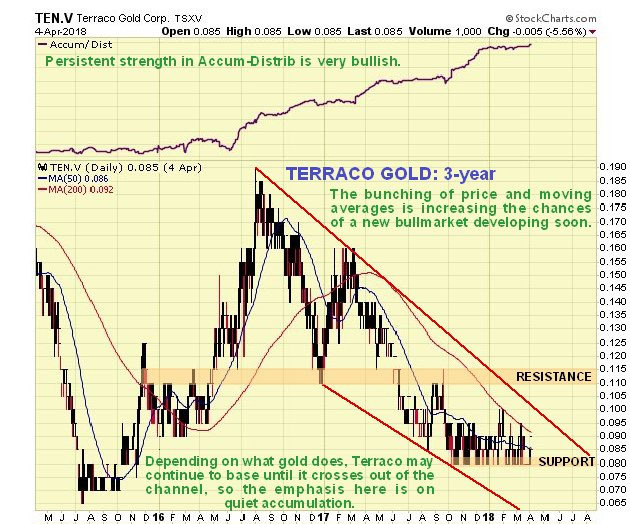 Technical analyst Clive Maund looks at a gold royalty company that he believes will take off when the gold bull market gets underway. Money manager Adrian Day discusses two companies in his portfolio, one with positive developments, the other less so, though both are buys, particularly the one whose stock price has dropped. 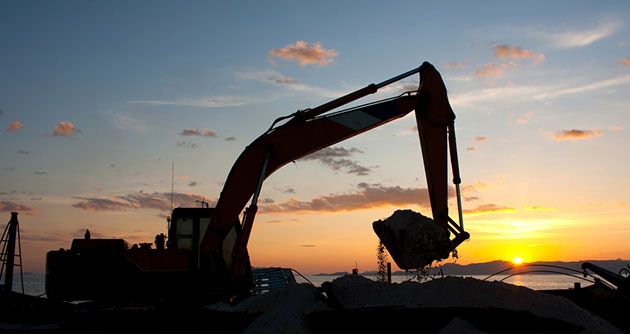 Analyst Andrew Kaip with BMO Capital Markets provided an update on what transpired during the period in which his firm was prohibited from writing about this miner. Jacques Wortman, an analyst with Eight Capital, outlined the key takeaways from this miner's new reports and increased the firm's target price.